Discussion in 'Science' started by waltky, Dec 2, 2016. Fri, 02 Dec 2016 - The brain disorder Parkinson's disease may actually start with bacteria living in the gut, according to scientists. 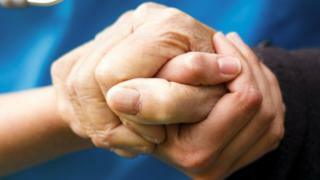 Scientists in California say they have transformed understanding of Parkinson's disease. Their animal experiments, published in the journal Cell, suggest the brain disorder may be caused by bacteria living in the gut. The findings could eventually lead to new ways of treating the disease, such as drugs to kill gut bugs or probiotics. Experts said the results opened an "exciting new avenue of study". In Parkinson's disease the brain is progressively damaged, leading to patients experiencing a tremor and difficulty moving. Researchers used mice genetically programmed to develop Parkinson's as they produced very high levels of the protein alpha-synuclein, which is associated with damage in the brains of Parkinson's patients. But only those animals with bacteria in their stomachs developed symptoms. Sterile mice remained healthy. Further tests showed transplanting bacteria from Parkinson's patients to mice led to more symptoms than bacteria taken from healthy people. Dr Timothy Sampson, one of the researchers at the California Institute of Technology, said: "This was the 'eureka' moment, the mice were genetically identical, the only difference was the presence or absence of gut microbiota. "Now we were quite confident that gut bacteria regulate, and are even required for, the symptoms of Parkinson's disease." The scientists believe the bacteria are releasing chemicals that over-activate parts of the brain, leading to damage. The bacteria can break down fibre into short-chain fatty acids. It is thought an imbalance in these chemicals triggers the immune cells in the brain to cause damage. Dr Sarkis Mazmanian said: "We have discovered for the first time a biological link between the gut microbiome and Parkinson's disease. "More generally, this research reveals that a neurodegenerative disease may have its origins in the gut and not only in the brain as had been previously thought. "The discovery that changes in the microbiome may be involved in Parkinson's disease is a paradigm shift and opens entirely new possibilities for treating patients." Parkinson's is currently incurable. While the findings need to be confirmed in people, but the researchers hope that drugs that work in the digestive system or even probiotics may become new therapies for the disease. The trillions of bacteria that live in the gut are hugely important to health, so wiping them out completely is not an option. Dr Arthur Roach, from the charity Parkinson's UK, said: "In recent years, evidence has been growing that Parkinson's may begin in the gut, but the chain of events involved has so far remained a mystery. "This work opens an exciting new avenue of study on the gut-brain connection in Parkinson's. "There are still many questions to answer, but we hope this will trigger more research that will ultimately revolutionise treatment options for Parkinson's." Dr Patrick Lewis, from the University of Reading, said: "This study really does reinforce the idea that examining what goes on in the stomach of people with Parkinson's could provide really important insights into what happens in disease, and potentially a new area of biology to target in trying to slow down or halt the changes in the brain." July 30, 2018 — Japanese scientists said Monday they will start clinical trials next month on a treatment for Parkinson's disease, transplanting "reprogrammed" stem cells into brains, seeking a breakthrough in treating the neurodegenerative disorder. Parkinson's is caused by a lack of dopamine made by brain cells, and researchers have long hoped to use stem cells to restore normal production of the neurotransmitter chemical. The clinical trials come after researchers at Japan's Kyoto University successfully used human-induced pluripotent stem cells (iPS) to restore functioning brain cells in monkeys last year. So-called iPS cells are made by removing mature cells from an individual — often from the skin or blood — and reprogramming them to behave like embryonic stem cells. They can then be coaxed into dopamine-producing brain cells. 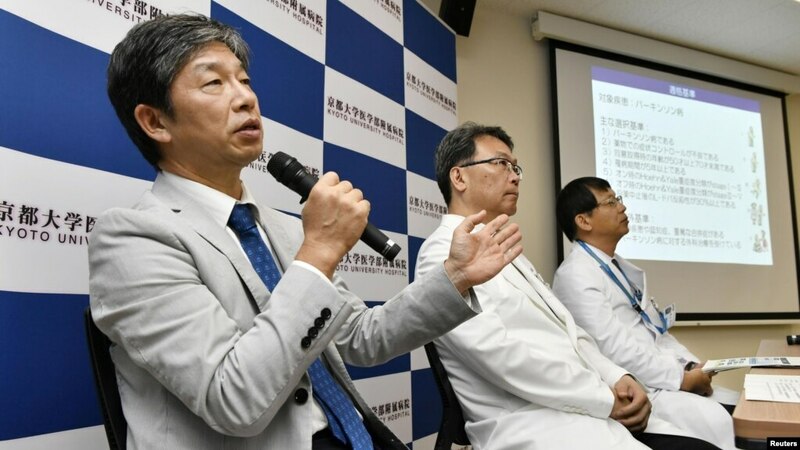 "This will be the world's first clinical trial using iPS cells on Parkinson's disease," Jun Takahashi, professor at Kyoto University's Centre for iPS Cell Research and Application, told a news conference. The center is headed by Shinya Yamanaka, who in 2012 shared a Nobel Prize for medicine with a British scientist, John Gurdon, for the discovery that adult cells can be transformed back into embryo-like cells. "We intend to carry on conducting our research carefully, yet expeditiously, in coordination with Kyoto University Hospital, so that new treatment using iPS cells will be brought to patients as soon as possible," Yamanaka said in a statement. Rock Steady Boxing NOVA gym opened in McLean, Virginia, outside Washington, D.C., last December. That was the good news for 75-year-old Neil Eisner, who was diagnosed with Parkinson's six years ago and finds boxing an effective way to fight back against the disease. 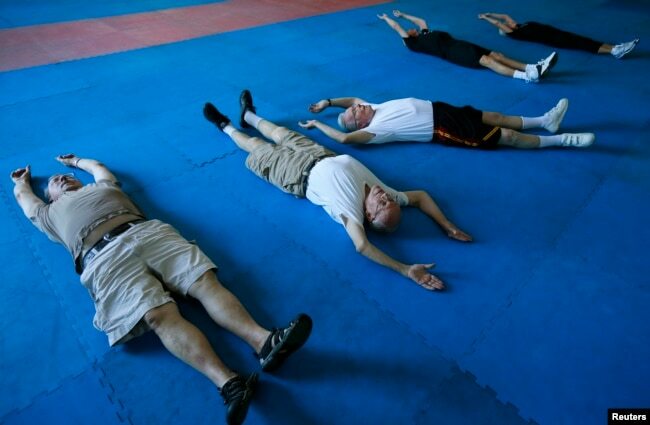 Rock Steady Boxing (RSB) was designed especially for people with Parkinson's, a neurodegenerative disorder that leads to tremors and balance problems. Each exercise in the program focuses on a specific skill — one is combining punches on a bag to work on strength, another is crawling across the floor. Eisner says the exercises help him perform everyday tasks like moving around and getting in and out of bed. Some strengthening exercises target vocal cords. "One of the things that's interesting enough is [Parkinson's patients] tend to have a [softer] voice. When you have that lower voice, and people can't hear you, you don't realize. So, he asks us to bring our voice clearly and more loudly," Eisner said. For personal trainer Alec Langstein, working with an older population is familiar. He understands their health issues and the need for them to stay active. "My aunt has a gym in Westchester, New York, and she does a Rock Steady Boxing program there," he said. "She invited me up to her gym to check out the program. She thought it would be a perfect fit for what I do. I helped out with a few classes, and it was just, I thought, an amazing program." The Rock Steady Boxing nonprofit was founded in 2006 by attorney Scott C. Newman, who was looking for ways to stay active after being diagnosed with Parkinson's at age 40. Since then, more than 500 boxing programs have been introduced in the U.S. and around the world. Langstein went to the organization's headquarters to become an RSB-licensed trainer, and a few months later, he opened his Rock Steady Boxing NOVA gym. "It's a typical boxing program," he explained. "They focus on balance, hand-eye coordination, reaction, footwork. There is some cognitive stuff because in boxing, certain numbers equal certain punches. So, when I yell certain numbers, you have to move and react at the same time. So, the brain and the body are working together. It's also taking out the aggression some people may have out of having the disease." To understand how RSB can help Parkinson's patients, physical therapist Danielle Sequira says it's important to know what triggers the symptoms. "Parkinson's mainly affects the dopamine-producing cells in the brain. That leads to a lack or a loss of dopamine, which contributes to the movement difficulties," she said. While boxing and other exercises don't cure the disease or stop the dopamine decline, they can improve the patient's quality of life. Exercises can be modified for people with Parkinson's, including those in wheelchairs. "The research shows that exercise helps the brain use dopamine more efficiently," Sequira said. "My goal usually, after I work with some of my patients with Parkinson's, is to refer them out to get involved in an exercise program out in the community."